CSS position sticky has really good browser support, yet most developers aren’t using it. The reason for that is twofold: First, the long wait for good browser support: It took quite a long time for browser support to happen, and by the time it did the feature was forgotten. The second reason is that most developers don’t fully understand the logic behind how it works, and that’s where I come in. Up until 3 years ago, there were four CSS Positions: static, relative, absolute and fixed. The main difference between static or relative and absolute or fixed was the space they take up in the flow of the DOM. Positions static & relative keep their natural space in the flow of the document, while the absolute & fixed don’t — their space is removed and they have a floating behavior. The new Position Sticky has similarities with all types, as I will soon explain. I assume most of you have played with position sticky. So had I for quite a while, until I realized that I didn’t totally understand it. On the first play with position sticky, everyone quickly understands that the element sticks when the viewport gets to the defined position. The problem is that sometimes it works while other times it doesn’t. When it does work, the element sticks, but in other parts of the scrolling it stops sticking. As someone who eats and breaths CSS daily, it was unacceptable for me to not understand the issue to its root , so I decided to thoroughly explore Position Sticky. While playing with it, I quickly noticed that when an element with a position: sticky style is wrapped, and it is the only element inside the wrapper element, this element, which was defined position: sticky will not stick. When I added more elements inside the wrapper element, it started working. The reason for that is that when an element is given the position: sticky style, the sticky item’s container is the only area in which the sticky item can stick. The item doesn’t have any elements to float over since it can only float over sibling elements, which, being an only child, it doesn’t have. 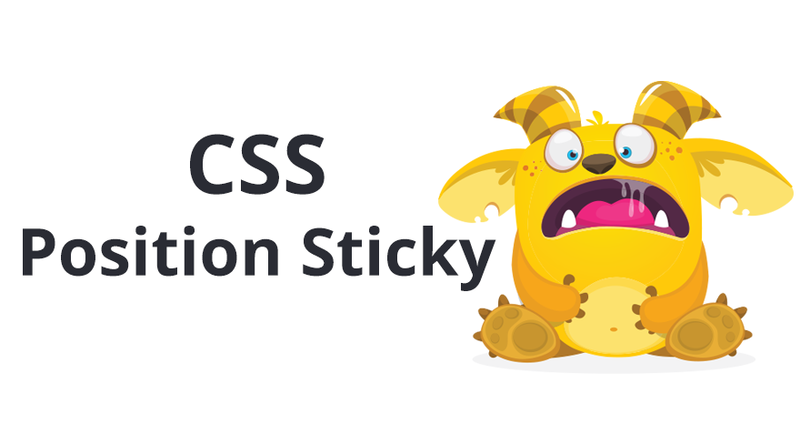 How CSS Position Sticky Really Works! 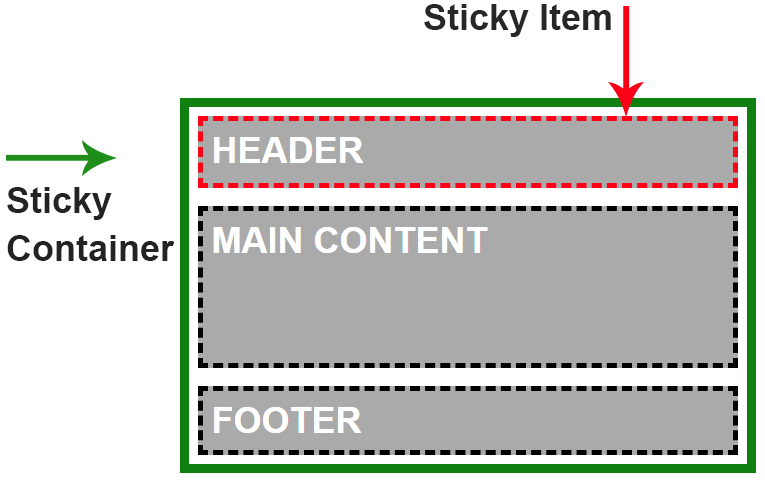 CSS position sticky has two main parts, sticky item & sticky container. Sticky Item — is the element that we defined with the position: sticky styles. The element will float when the viewport position matches the position definition, for example: top: 0px . Sticky Container —is the HTML element which wraps the sticky item. This is the maximum area that the sticky item can float in. When you define an element with position: sticky you’re automatically defining the parent element as a sticky container! This is very important to remember! The container is the scope of the sticky item, and the item can’t get out of its sticky container. This is the reason why in the previous example, the sticky item didn't stick in the first place: The sticky item was the only child element in a sticky container. Relative (or Static)— the stickily positioned element is similar to the relative and static positions because it keeps the natural gap in the DOM (stays in the flow). Fixed— when the item sticks, it behaves exactly like position: fixed, floating in the same position of the view-port, removed from the flow. Absolute — at the end of the sticking area, the element stops and stacks on top of the other element, much like an absolutely positioned element behaves inside a position: relative container. But you can also use it to stick elements to the bottom. That means that the footer can be defined to have a sticky position, and it will always appear to stick to the bottom when scrolling down. When we reach the end of the sticky container, the element will stop in its natural position. It’s better to use it on elements whose natural position is the bottom of the sticky container. I use it in real life for sticky summary tables, and I can think of sticky footer navigation, which can work very nicely using this method. Position Sticky is supported by all major modern browsers, except for old IE. For Safari browsers you will need to add the -webkit prefix. I hope you’ve enjoyed this article and learned from my experience. I am Elad Shechter, a Web Developer specializing in CSS & HTML design and architecture. I work at Investing.com.